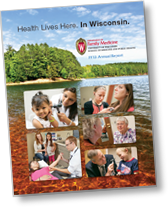 The DFMCH’s FY18 Annual Report is a summary of our activities from July 1, 2017, through June 30, 2018. 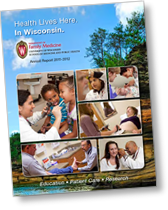 We continue to uphold our commitment to educating primary care providers for Wisconsin. We look forward to building on our educational partnerships, further improving how we care for patients, strengthening our research program and expanding our community health efforts. 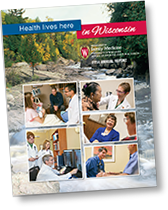 The DFMCH’s FY17 Annual Report is a summary of our activities from July 1, 2016, through June 30, 2017. 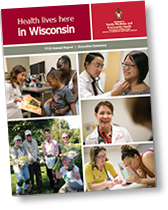 Our commitment to educating primary care providers for Wisconsin remains strong. We look forward to strengthening our educational partnerships, continuing to improve how we care for patients, expanding our research portfolio and deepening our community health efforts. The DFMCH’s FY16 Annual Report is a summary of our activities from July 1, 2015, through June 30, 2016. We completed our first year as the Department of Family Medicine and Community Health. We’re excited to strengthen our community health endeavors, further improve how we care for our patients, expand our research and educate even more primary care providers for the state, nation and world. The DFM’s FY15 Annual Report is a summary of our activities from July 1, 2014, through June 30, 2015. In FY15, we provided outstanding care for 414,112 patient visits in 21 statewide clinics, plus 28,074 patients at three urgent care sites. 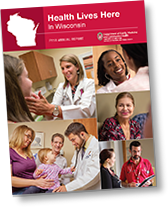 We continued to improve patient care quality and delivery through the UW Health primary care redesign initiative. The DFM’s FY14 Annual Report is a summary of our activities from July 1, 2013, through June 30, 2014. 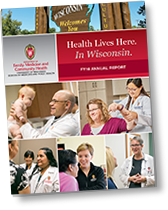 We continue to progress toward becoming a department of family medicine and community health though curricular enhancements, clinic-based healthy living initiatives, and local partnerships. Because health lives here, in Wisconsin. The DFM’s FY13 Annual Report is a summary of our activities from July 1, 2012, through June 30, 2013. As healthcare undergoes some of the biggest changes in generations, we in family medicine are excited about our role in shaping its future. Because health lives here, in Wisconsin. The DFM’s 2011–2012 Annual Report summarizes our activities from July 1, 2011, through June 30, 2012. It’s an exciting time for family medicine. Many changes lie ahead—for all of healthcare, not just family doctors—but we’re facing the future with strength and enthusiasm. Because health lives here, in Wisconsin. 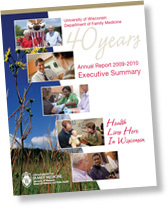 The DFM’s 2010–2011 Annual Report summarizes our activities from July 1, 2010, through June 30, 2011. Despite decreasing state support and an increasingly competitive marketplace, our department continued to grow and thrive. Welcome to the DFM’s 2009–2010 Annual Report. This report summarizes our activities from July 1, 2009, through June 30, 2010. We invite you to peruse our report, and encourage you to contact us with questions or comments. The UW Department of Family Medicine. Health lives here. In Wisconsin.